By Brother Guy S. Williams. On March 17, 1926, six Master Masons from Auburn met at the home of Brother John E. Riley to consider the advisability of forming a Masonic Lodge in Auburn. Present at the first meeting were Brothers Charles I. Newton, Robert Gow, Clifford M. Allen, Frithiof Holstrom, Fred Kingdom and John E. Riley. After several meetings the number increased until on April 13, 1926, forty Brethren met in the Congregational Parish House and voted to petition the Most Worshipful Grand Master of Masons in Massachusetts, Frank L. Simpson, for a dispensation for a Lodge in Auburn. It was an unanimous choice that the Lodge be called Joel H. Prouty Lodge. Brother Joel H. Prouty was a long respected and honored resident of Auburn, a member of Morning Star Lodge, the holder of the Henry Price Medal and Veteran's Medal of his Lodge. Brother Prouty was not present when the Lodge bearing his name was instituted, as he had passed away on September 29, 1926 at the age of 89 years and 2 days. It was arranged to use the Town Hall as a meeting place at a nominal fee. Joel H. Prouty Lodge was instituted on Tuesday evening, March 29, 1927 in the Auburn Town Hall by Right Worshipful Otis C. White, District Deputy Grand Master of the Worcester 21st Masonic District, with 48 brethren and 51 visitors present. 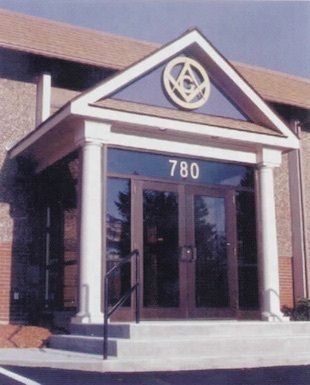 The Lodge was constituted on March 27, 1928 by Most Worshipful Grand Master Frank L. Simpson and the Grand Lodge Officers. 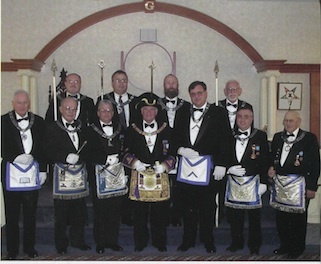 Brother John Tuck was installed the first Master under the Charter. (1928 Mass. 67-96) Brother Ralph E. Hardy was the first candidate raised in short form with Brother George O'Keep following in long form in the Lodge. The first attempt to build a temple was made at a meeting held at the Highland Farm Cabin in the fall of 1929, with about 40 brethren attending the meeting. 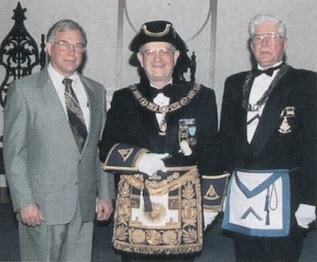 The late Worshipful Harry E. Sibley was Master of the Lodge; Brother John E. Riley was secretary of the committee. Other Brethren active in this movement were Brothers John F. Bridgeman, Fred Kingdom, Hollis Pratt and John Tuck. Many offers of donations in money and materials were made by those present. Land on South Street near the South West cutoff was offered, but it was decided that the income of the Lodge was insufficient to support a building. In 1940, a building committee of the Lodge purchased a lot of land on Central Street, near the Meriam Public Library, but this was later sold. In 1948, about three acres of land was purchased on Auburn Street near the high school. In November 1948, the William B. Smith property on Hampton Street was advertised for sale and through the influence of Brother John E. Riley, this property was purchased at a very low price. The Auburn Masonic Charitable Association was formed and chartered by the State on December 31, 1949 and the Deed to the Smith property was recorded on January 15, 1950, Book 3261, Page 175. About $10,000 was raised by the Lodge to transform the property to a Masonic Temple and many articles were donated. The Temple was dedication on October 19, 1949 by Most Worshipful Roger Keith, and the Grand Lodge Officers. (1949 Mass. 146-148) By 1952, after 25 years of continuous growth, an organization with 405 members was an intricate part of Auburn and meant much to its citizens. Pakachoag Chapter No. 224, Order of the Eastern Star, has given much of their time, efforts and money to help our endeavors as exemplified in furnishing the kitchen and supplying the women's touch. The Lodge has sponsored the DeMolay Chapter and the Rainbow Assembly until that was taken over by Pakachoag Chapter. Nothing can be more worthwhile to the community than the moulding of the lives of young boys and girls. Members of Joel H. Prouty Lodge have given generously of their blood through the Masonic Blood Program and it is a great satisfaction to know that because you gave, somebody lives. 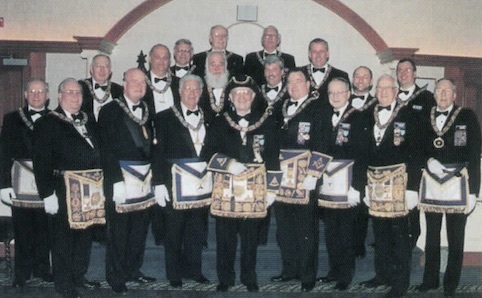 Joel H. Prouty Lodge has been honored during the past half century by four District Deputy Grand Master appointments: Right Worshipful W. H. Smiley Kingsbury, Right Worshipful John E. Riley, Right Worshipful Russell Waldren and our present District Deputy, Right Worshipful Clifford A. Parker. You will notice that I have not given very many figures, but you all know that it has taken thousands of hours and many thousands of dollars to maintain this Lodge for fifty years. Back in 1926, when a Lodge was first mentioned, there was talk of bad blood in Auburn and that politics would be a hinderance, but the results have proved otherwise. We have a beautiful Temple, excellent membership and a very bright future. Joel H. Prouty Lodge is to be congratulated on its achievements; and as the poet said, "Lives of Great Men all remind us we must make our lives sublime / and in departing leave behind us footsteps on the sands of Time." So it is with this Lodge as the masses go by our Temple on Southbridge Street in Auburn, they will say to themselves, there is one place that stands for all that is right in America. Bro. Wayne Salo, architect; M. W. Fred K. Bauer; Wor. Donald W. Murray, presiding Master. Front entrance at 780 Southbridge Street as seen from Route 12 South. 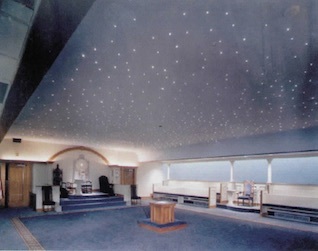 Inside the Lodge room looking East. Cherry wood has been used in all of the doors and trim. The Five Orders of Architecture are all represented within the room and the starry decked heaven is illuminated by the use of fiber optics. Most Worshipful Fred K. Bauer performed a rededication ceremony April 22 of the Lodge building which was extensively refurbished. New paneling, rugs, ceiling, heating, air conditioning, lighting, plumbing were installed according to the plans of the architect, Bro. Wayne Salo of Mumford River Lodge. On June 1, the contractor was challenged to have all the reconstruction work completed by September 13. Much to everyone's amazement, it was accomplished on time. Present at the ceremony were M. W. David B. Richardson and M. W. Edgar Darling and their wives. First row: M. W. Edgar W. Darling, R. W. Donald W. Gillis, R. W. Bruce K. Pratt, M. W. Fred Kirby Bauer. R. W. Richard W. Burgess, R. W. Paul W. Rolston, M. W. David B. Richardson, R. W. Fred A. Dobson. Second row: R. W. Robert Faulkner; R. W. and Rev. John R. S. Higgins; R. W. Charles F. Egreus, Sr.; R. W. and Rev. Albert W. Welch; Wor. C. Macaulay Ward. Jr.; Wor. Alan B. Bennett; Wor. David S. Tinkham. Third row: Wor. Henry Huke. Ill; R. W. Robert E. McDuffie; Wor. David Kramer and Wor. David B. Harte. The front foyer. 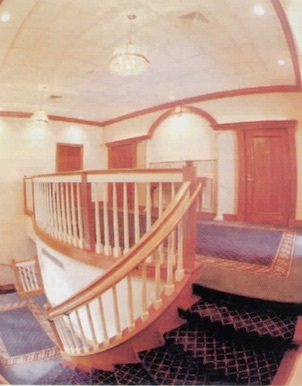 The spiral staircase to the second level and Lodge room, and to the lower level banquet hall. All doors, balusters, handrails, newels and trim were constructed from cherry wood. Lodge in Auburn, on the occasion of that Lodge's 75th anniversary. This page was last modified on 21 March 2019, at 15:29.